Assassins and desperados quant. suff. Noises, whispers and groans, three-score at least. 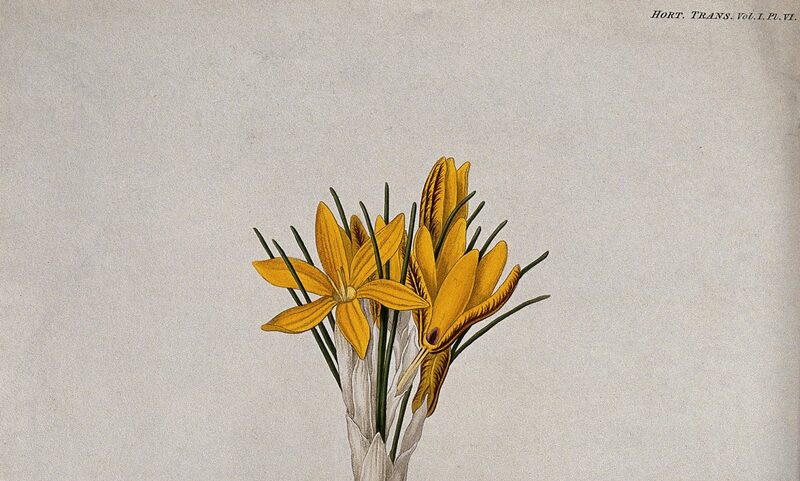 Mix them together, in the form of three volumes, to be taken at any of the watering-places before going to bed. PROBATUM EST. This satirical piece plays with generic expectation to amuse readers. The recipe, a familiar domestic literary genre, has its own conventions: “Take–“; “Mix…”; “[T]o be taken.” The genre requires specificity: here, the castle is not just old, but must be also half ruined. The old woman is not only hanging, but her throat must also have been cut. Smaller words from the recipe lexicon appear to describe the precise arrangement of ingredients needed for this three-volume novel. The murdered bodies are not only meticulously quantified, but also specified as to quality, “quite fresh.” As the recipe continues, features of the Gothic novel that might normally be considered exceptional or unquantifiable are multiplied and quantified: assassins, desperados, noises, whispers and groans. When enumerated thus, such features become mundane… and funny. The recipe formula exposes the formulaic quality of gothic novels, and such gothic recipes appeared regularly in journals in the late eighteenth and early nineteenth centuries. Mixing these ingredients together, as gruesome as they are, always produces the same result, a fact attested to by the Latin postscript PROBATUM EST, a testimony that the recipe has been tested, and will work the same each time. The three volumes of the novel produced are objects for consumption, not artistic works. They are untitled and interchangeable. The first wave of gothic novels published in Great Britain in the late eighteenth century introduced eager readers—most often young ladies—to a long list of terror-inducing conventions: ruined castles, haunted monasteries, incestuous abductions, demonic pacts, tortured corpses, and horrible secrets. 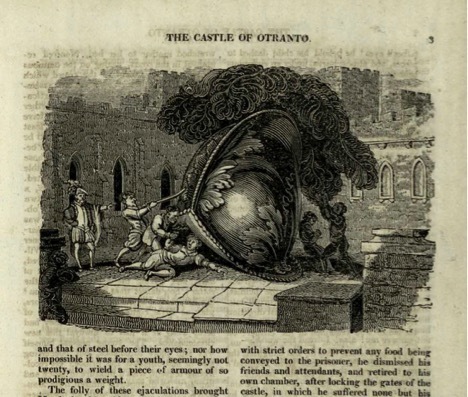 The first gothic novel, Horace Walpole’s The Castle of Otranto (1764), lent the genre its name and featured a unique story line with alarming mysterious events such as death by giant helmet crushing. In the preface to The Old English Baron (1778), another early gothic novel that features a plot with a stolen inheritance, a rightful heir, and a ruinous castle, author Clara Reeve acknowledges her debt to Walpole. She sets out to “fix” Walpole’s errors, creating a new work, yet still describing her novel as “the literary offspring of The Castle of Otranto.” As this example demonstrates, a growing genre is naturally imitative. Death by giant helmet! Illustration from the 1824 edition of Walpole’s The Castle of Otranto (Image credit: Creative Common license, University of St. Andrews Library Special Collections, Fle PR1297.E23). There you have it, a novel à la Radcliffe! Somov’s “Plan” and the anonymous recipe above rely on the same methods for producing humor through mundanely quantifying atmospheric pieces. The ubiquity of the gothic genre’s typical props, settings, and tropes meant that critics considered them formulaic and unoriginal. These recipes suggest that creating novels in this vein is a matter of following a basic plan, implying that Radcliffe’s novels are imitative and easily reproduced. However, while critics complained, the novels with their improbable plots and excessive horrors were widely popular, demonstrating that literary merit and public taste are not necessarily the same. Ann Radcliffe’s novels, in particular, were reprinted in multiple new editions each year; less than a decade after its original publication, by 1803, The Mysteries of Udolpho (1794), her most famous, had already been printed in five new editions in Britain. In early nineteenth-century Russia, her name on a cover was enough to make a best seller, and a number of books she did not write were attributed to her, including translations of Matthew Lewis’s novel The Monk (1796) and original novels written by Russian translators, who could produce new gothic novels faster than they could translate them. Radcliffe was the most-read writer in late eighteenth-century Britain, and exercised influence, even abroad, years after her death. In the 1860s, Fyodor Dostoevsky, for example, recalls his childhood love for Radcliffe’s novels: “I used to spend the long winter hours before bed listening (for I could not yet read), agape with ecstasy and terror, as my parents read aloud to me from the novels of Ann Radcliffe. Then I would rave deliriously about them in my sleep.” This quote and others like it make me wonder: Are the critics right when they say that gothic novels are all basically the same? How can a repeated reading experience produce such a powerful effect? 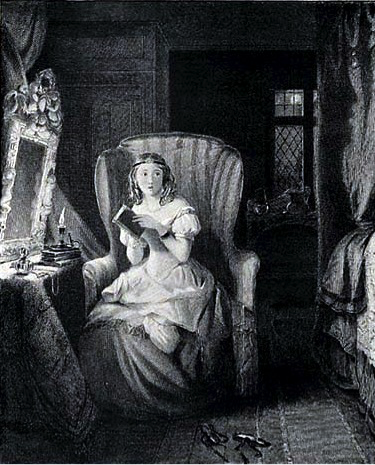 Even if gothic novels are formulaic, to have such an impact on a reader years afterward demonstrates their influence, so why were critics so reluctant to take them seriously? Can genre fiction ever be considered great literature? Thinking about these gothic recipes, there’s more to them than just a demonstration of the formulaic nature of the genre. Recipes may produce the same result each time, but a recipe is repeated when the results are delicious. And when a novel is good, we devour it… or savor it, like a tasty meal. As even the “Terrorist Novel Writing” author acknowledges, three-volume novels of terror taken before bed in a leisurely way can be very pleasant indeed. Katherine Bowers is an Assistant Professor of Slavic Studies at the University of British Columbia. She specializes in eighteenth- and nineteenth-century Russian literature and culture. Currently she is working on a book about the influence of gothic fiction on Russian realism. Cited and translated in: Alessandra Tosi, Waiting for Pushkin: Russian Fiction in the Reign of Alexander I (1801-1825) (Amsterdam: Rodopi, 2006), 84-85. Fedor Dostoevskii, Zimnie zametki o letnikh vpechetleniiakh, in Polnoe sobranie sochinenii v 30 tomakh (Moscow: Nauka, 1972-1990), Volume 5, 46. Translated by David Patterson, in Fyodor Dostoevsky, Winter Notes on Summer Impressions (Evanston: Northwestern University Press, 1997), 1-2. Great post. I LOVE this recipe! Next PostNext Van Helmont on the Plague, Again!